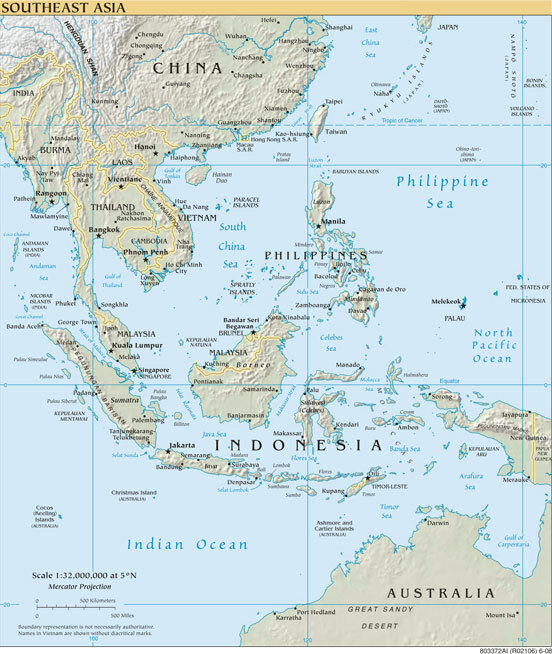 Malaysia is located in central Southeast Asia. 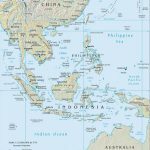 It borders Thailand on the north, Singapore and Indonesia on the south and the Philippines on the east. 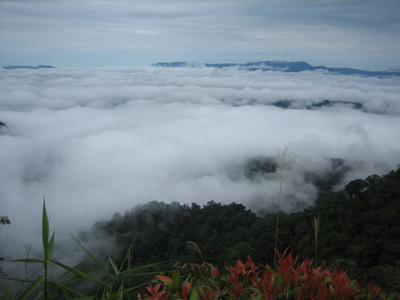 It is composed of Peninsular Malaysia and the 2 states of Sabah and Sarawak on the northern part of Borneo island. 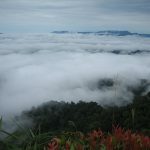 It is one of the most pleasant and hassle-free places to visit in Southeast Asia. 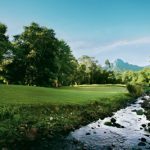 It offers great diving, sun-drenched beaches, enchanting islands, diverse flora and fauna, forest retreats and magnificent mountains. 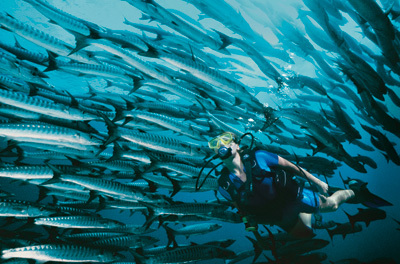 The legendary Sipadan Island should be on every diver’s life list. Jacques Cousteau called it an “untouched piece of art”. 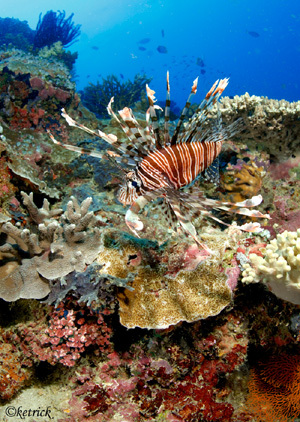 The coral is pristine and the reef inhabitants are colorful, widely varied, and plentiful. The dramatic drop-offs nearly all the way around the island form breathtaking walls that are fed by a healthy current, carrying with it lots and lots of big fish. Tremendous schools of jack and barracuda, bumphead parrotfish, sharks, and turtles are virtually guaranteed. 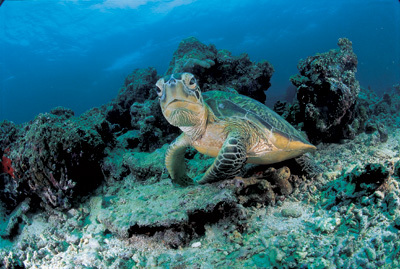 You can expect to see turtles on almost every dive, munching, napping, or curiously checking out divers. 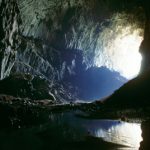 Yes, Sipadan is the jewel in the crown of Malaysian diving, but it would be a shame to travel so far and not take a look at the other gems. A few minutes away are Kapalai Island, a critter haven of shallow coral communities and Mabul Island, one of the best “muck-diving” sites in the world! 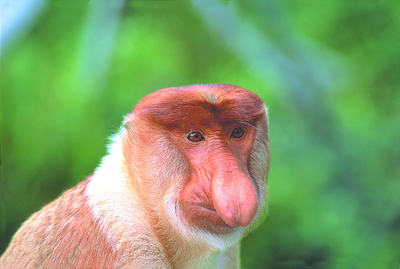 And then there are Layang Layang and Lankayan…..are you sure you don’t want to extend your stay? 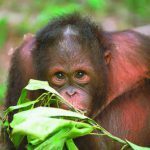 Borneo Divers, founded by dive industry icon and DEMA Hall of Famer Clement Lee, is the dive operation frequently credited with pioneering diving in Southeast Asia, particularly around Sipadan Island. They were among the first to establish a dive resort on Sipadan and also were among the first to vacate in order to promote and support conservation efforts there. Do you really want to dive Sipadan with anybody else? 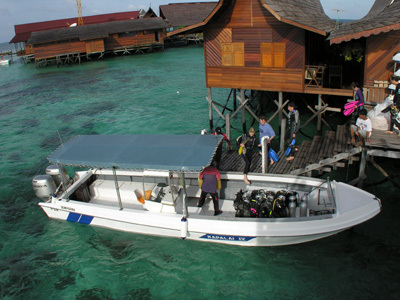 Borneo Divers Mabul Resort on Mabul Island is now the main base of operations. 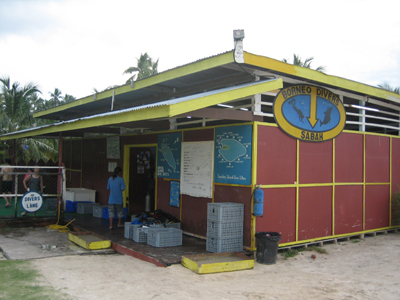 Facilities include a fully equipped dive station just steps from the beach. Designed for convenience, this dive station features top quality rental equipment and plenty of space for rinsing your gear. Gear storage and personal lockers are also available. The friendly dive staff will take care of loading and unloading tanks. A fleet of modern speedboats provides fast, comfortable and safe transportation to all of the amazing dive sites on your itinerary. 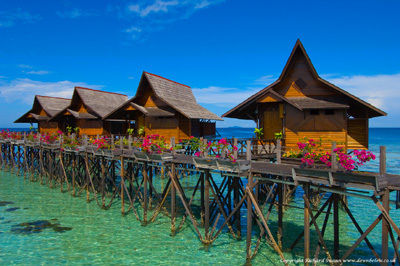 Sipadan Island is approximately 15 minutes away. Sit back, relax and get ready to experience some of the best diving in the world! 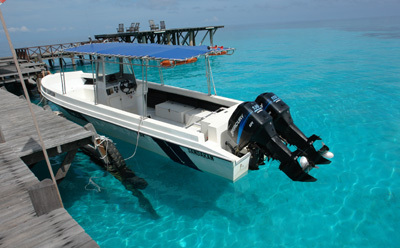 You’ll enjoy three dives a day with one sunset bonus boat dive without a divemaster at the Mabul House Reef. Because many dive sites are quite close, you may enjoy surface intervals back in the comfort of your chalet, depending on your dive schedule. 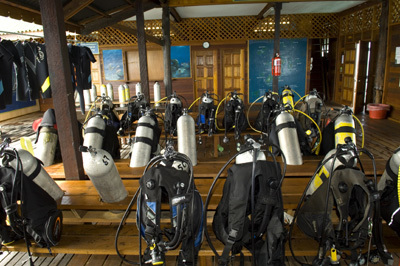 Discover Scuba courses are also available, although you may spend the rest of your life trying to top your first dive…..
Sipadan-Kapalai Dive Resort is just a short boat ride away from the world class diving found at Sipadan Island. Apart from Sipadan, Kapalai Island is known for its exceptional macro diving, and is home to mandarin fish, flamboyant cuttlefish and a variety of frogfish. 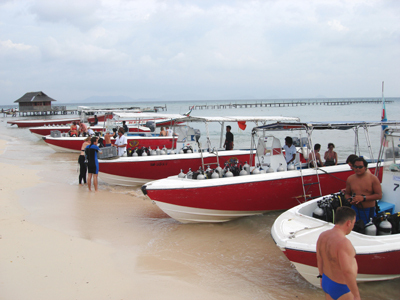 A fleet of speedboats will quickly transport you to Sipadan Island….or to any of the 25+ dive sites around Kapalai. 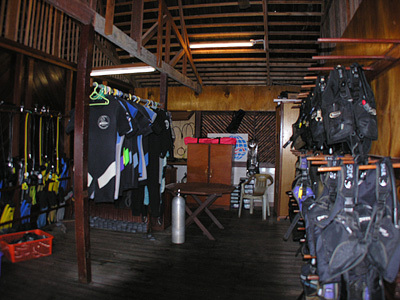 The on-site dive center provides diving, snorkeling, and kayaking gear and equipment for rent, as well as plenty of guest storage space. 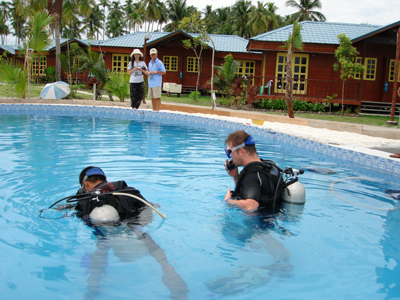 PADI Discover Scuba, Open Water, Advanced Open Water, and Intro to Night Diving courses are also offered. Lankayan Island boasts over 30 dive sites, including 2 wrecks. All sites are just a short boat ride from the jetty. 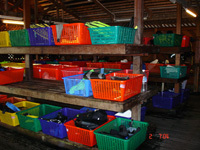 Dive rental equipment is available at the dive center, as well as snorkeling and kayaking equipment. The in-house PADI dive center at Layang Layang Island Resort is headed up by a team of 6 qualified dive masters and boasts 10 Catamaran boats. 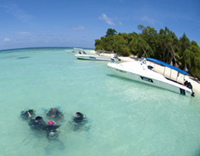 All dive sites are within 10-15 minutes of the resort. Equipment includes 300 aluminum tanks (80 cu ft), Bauer KAP 180 compressors, 20 sets of ScubaPro BCDs and regulators, and plenty of fins, masks, booties, weights and belts. 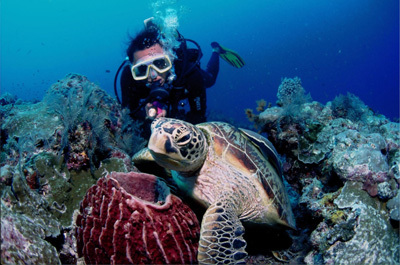 A full range of courses and certifications from Discover Scuba through Dive Master is offered. 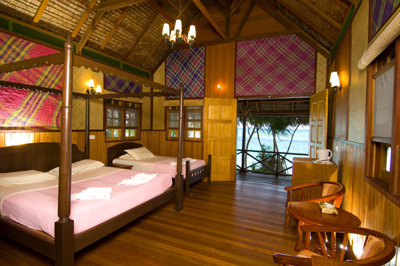 Additional activities include windsurfing, snorkeling, kayaking and bird watching. This 40 acre island is surrounded by a pristine reef that plunges dramatically into the abyss nearly all the way around. The vertical topography and rich currents provide perhaps the best wall diving in the world! On an average day of diving, you’ll see 50 turtles, a dozen sharks, enormous schools of jacks and barracuda, and an abundance of reef fish and macro life. Just 20 feet from the shore, the wall plunges a staggering 2,000 feet down and is encrusted with a wide variety of corals and sponges. This site is rated as one of the top 5 beach dives in the world, and for good reason. Soon after entering the water, you’ll be swimming with a school of several hundred jacks. You’ll also encounter bumphead parrotfish, whitetip sharks, grey reef sharks, green turtles, lionfish and a multitude of smaller reef fish. Don’t let all of this distract you from exploring the wall’s nooks and crannies, though, as there are plenty of small creatures to discover. This wall consists of terraces covered in overflowing yellow, lavender, and pink soft coral. Hawksbill & Green Turtles live on the ledges at this site and the current is usually quite calm. Search the coral and gorgonian fans for a variety of photogenic microlife. Look for coral groupers, sweetlips, gobies, hawkfish, emperor angelfish and moray eels in and around the cracks and crevices along the wall. Turtles, ribbontail stingrays, and a variety of sharks are also common here. This site is home to a large number of Hawksbill & Green Turtles. It is rather barren in comparison to some of the other sites, but there are some impressive staghorn coral stands, leather corals and small table corals and some colorful anemones with resident anemonefish. You’ll come across spotted sweetlips, pufferfish, lionfish, morays, triggerfish and even leaffish if you’re lucky. Many reef sharks also frequent this site. As you make your way along the wall, you’ll find a multitude of corals and sponges teeming with life. 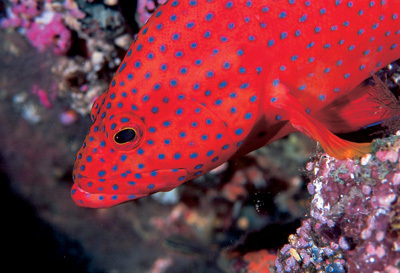 Look for groupers, nudibranchs, angelfish, triggerfish, grunts, shrimps, and gobies. 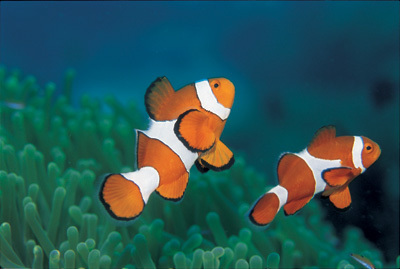 Many huge anemones with resident clownfish can be found here as well. There is usually a very strong current here, but experienced divers may opt to venture out toward the open ocean where large shoals of pelagics feed. Barracuda, leopard sharks, fox sharks, jacks, turtles, mantas, and hammerheads may all be spotted. As the name suggests, Barracuda Point is where a large concentration of barracuda, jacks, and grey and white tip reef sharks converge to feed. The current is strong here, ensuring an exciting dive. You’ll also see schooling bannerfish, triggerfish, and dogtooth tuna. Along the wall, look for bumphead parrotfish, yellow-margin triggerfish, Napoleon wrasse, and turtles. Virtually every species of marine life found in the waters of Sipadan can be seen here, in this garden atop a wall. The coral growth is colorful and healthy, and numerous featherstars add depth and movement to the scene. Dozens of green turtles feed at the edge of the wall, while clown and titan triggerfish take center stage. This is a macro photographer’s dream! Known as big fish capital, South Point features coral heads and a steep wall and attracts hammerheads, thresher sharks, and schools of bumphead parrotfish. This site is only for advanced divers as the current is usually strong and the water can be choppy. The diving at Kapalai is very different from that at Sipadan. The absence of large predators drawn to Sipadan’s drop-offs and currents makes for a Macroworld Paradise just begging to be explored. Small uncommon fish, invertebrates, and juveniles abound. Expect to see banded pipefish, blue ribbon and yellow ribbon morays, blue spotted stingrays, butterfly fish, cleaner shrimp, clown anemonefish, crocodilefish, grouper, humpback shrimp, lambis truncata seashells, mandarin fish, mantis shrimp, crab eyed gobies, spotted boxfish, squirrel fish, trumpet fish, nudibranchs, paperfish, triggerfish, porcupine fish, jawfish, razorfish, blue ring octopus, frogfish, ghost pipefish and more. 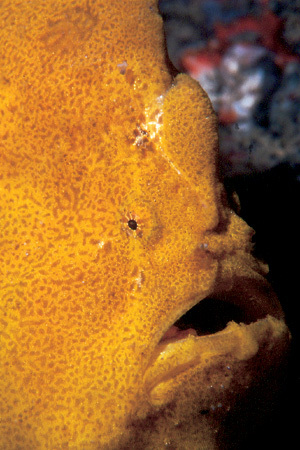 As you descend this coral slope, look for camouflaged frogfish and stonefish. Once you reach the sea floor, you’ll enjoy the site of cuttlefish, ghost pipefish, longnose hawkfish, crocodilefish, and nudibranchs taking shelter near the wreck of a small fishing boat. 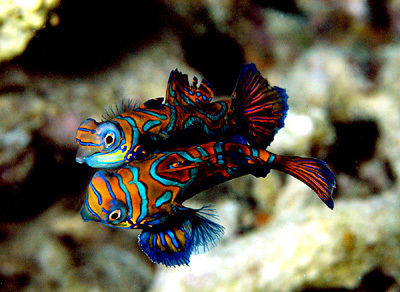 Dusk brings out the colorful mandarin fish, as well as a myriad of other small critters. 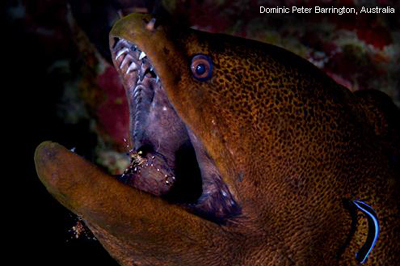 We’re sure you can guess what the highlight of this dive will be……. 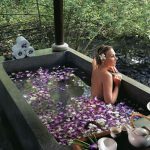 Situated only about 15 minutes by speedboat from Sipadan, and 30 minutes from mainland Semporna, Mabul is recognized as one of the world’s best “muck-diving” sites. The shallow coral reefs do not look very picturesque and inviting at first glance, but the diversity of macro life inhabiting the coral rubble and sea grass easily make up for that. 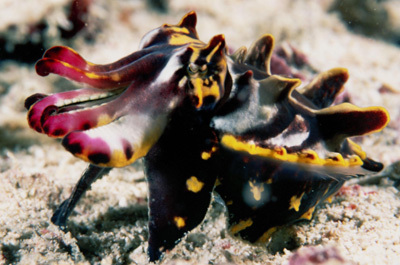 Flamboyant cuttlefish, blue-ringed octopus, mimic octopus, gobies and frogfish are everywhere, as are morays, snake eels, and practically the whole scorpion fish family. There’s no doubt about it, Mabul is a magical macro site! Slowly search this flat stretch of sand for oases of life. 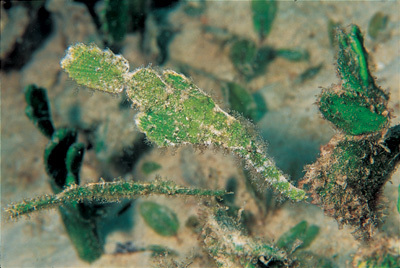 Patience will reveal ghost pipefish (harlequin & sea grass), seahorses, crocodile fish, garden eels, double-ended pipefish, tube anemones, and cowfish. 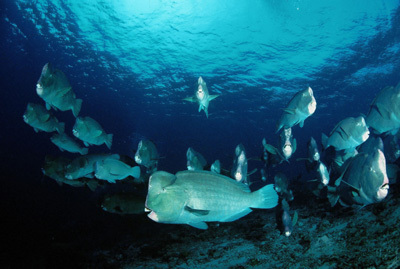 Occasional visitors include eagle rays, turtles, humpback parrotfish, barracuda, and mackerel. 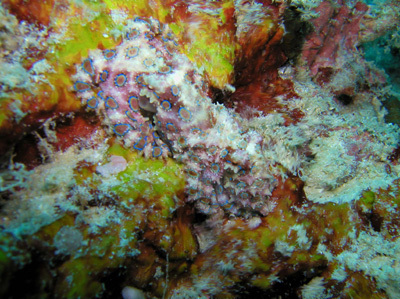 Night dives will reveal cuttlefish, nudibranchs, and a variety of crabs. Careful….not all is what it seems. What appears to be nothing but an area of stunted coral stands and discarded tires becomes something else when given a chance. 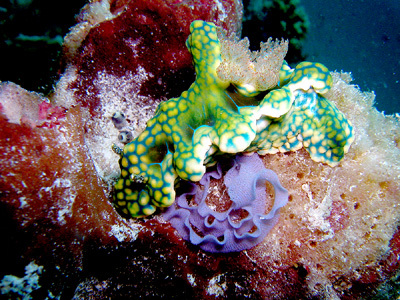 A thorough search will uncover frogfish, cowries, colorful nudibranchs, ghost pipefish, and the highly prized flamboyant cuttlefish! Aren’t you glad you didn’t judge this book by its cover? 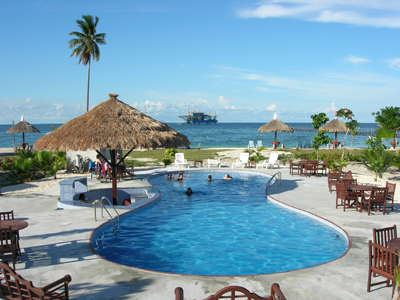 This is an old oil platform on pillars that has been converted into a hotel owned by Seaventures Dive Resort. 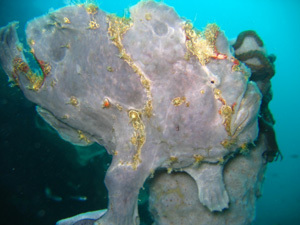 Beneath this platform, several piles of metal rods provide shelter for red, yellow, and black frogfish, nudibranchs, ghost pipefish, and huge morays. 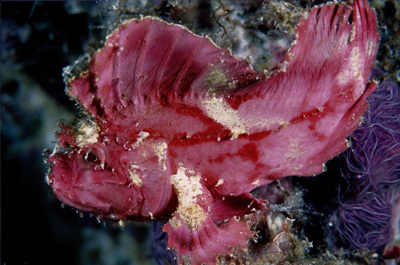 Also look for wasp fish, stonefish, flying gurnards, batfish and flute fish. A very unusual, yet interesting dive. This sheer, vertical drop plummets into oblivion and is breathtaking to behold. Adorned with colorful barrel sponges, coral formations, sea fans, sea whips, and anemones, the wall is a haven for arrow crabs and nudibranchs and a playground for schools of jack and surgeonfish. You’ll also enjoy spotting large tropical anthias, emperor angelfish, pygmy seahorses, groupers, giant frogfish, spotted sweetlips, orange-spined unicornfish, yellow breasted wrasse, and skunk anemonefish. White-tip sharks, grey reef sharks, hammerheads, and mantas also frequently cruise by. The shallow reef here is made up mainly of hard corals with a few species of soft coral thrown in. 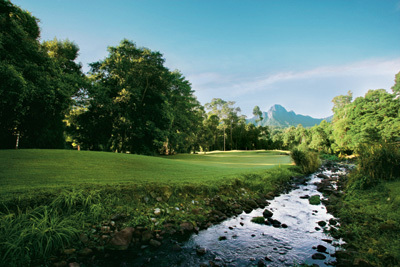 Residents include rabbitfish and bristletooth tang. 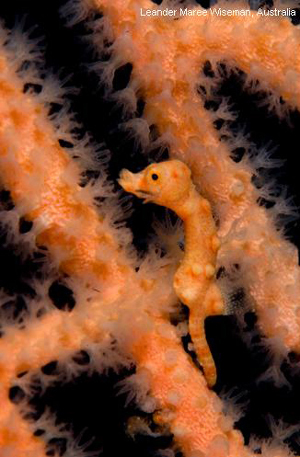 As you descend the slope, be sure to search the gorgonians for pygmy seahorses, as they are prevalent here. Leopard sharks, white-tip sharks, turtles, and neon fusiliers may all drift by as you explore the wall. This site is the main gathering place for hammerheads. 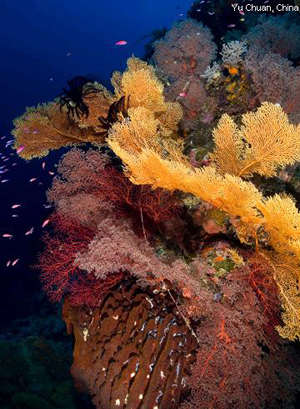 That and the lush, dense growth of colorful gorgonians that can be found here make it a favorite among divers. You’ll also see large barrel sponges, giant clams, hawksbill turtles, fusiliers, dogtooth tuna, trevally, red tooth triggerfish, pyramid butterflyfish, grouper, midnight snapper, harlequin sweetlips, surgeonfish, grey reef sharks, barracuda, round batfish, unicornfish, and more. A plethera of staghorn, plate, mushroom, table, and brain corals form a hard coral lover’s paradise of chimneys, cubby holes and gullies. Close exploration of these formations will surely reveal morays, squat lobsters, mantis shrimp, crayfish, crinoids, starfish, hermit crabs, and sea urchins. Anthias, trevally, turtles, pufferfish, parrotfish, scorpionfish, boxfish, and turkeyfish complete the underwater tableau. This is an excellent night dive! Lankayan is a macro lover’s paradise! 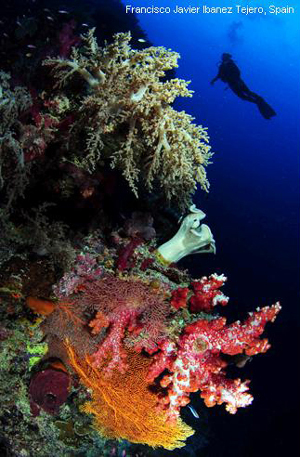 Beautiful hard and soft corals provide the perfect backdrop for a wide variety of marine life. Expect to see numerous juvenile fishes, lionfish, clown anemonefish, decorator and spider crabs, coral shrimp, nudibranchs, prawn gobies, jawfish, ornate ghost pipefish, and frogfish, as well as large schools of scad, yellow tail barracuda, jacks and more! 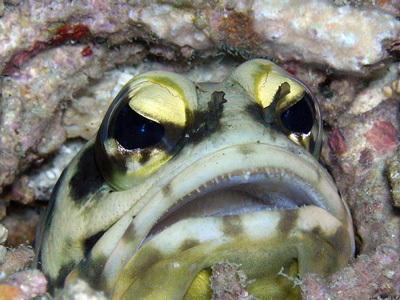 One of the most popular Lankayan dive sites, Jawfish Lair is home to more than just jawfish. Staghorn coral, table coral, bush coral, maze coral, and lobed pore coral provide homes for Christmas tree worms, nudibranchs, ornate ghost pipefish, cuttlefish, mimic octopus, devil scorpionfish, and anemonefish. You’ll also see stingrays, snapper, grouper, fusiliers, trumpetfish, and leopard sharks. 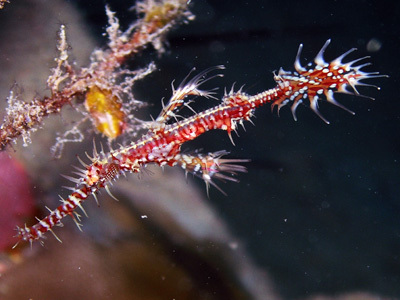 Once an ocean going fish poaching vessel, this shallow wreck is now a safe haven for cardinal fish, yellow pikes, grouper, cobias, emperor fish, yellow sea perch, and ornate ghost pipefish. 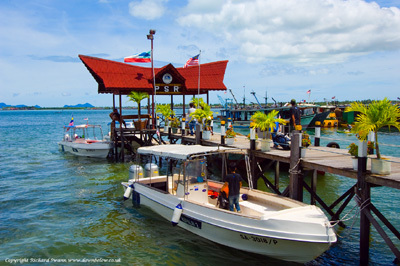 Located off the southeast coast of Sabah, Mabul Island is situated 30 minutes by speedboat from mainland Semporna and is just 15 minutes away from Sipadan Island. 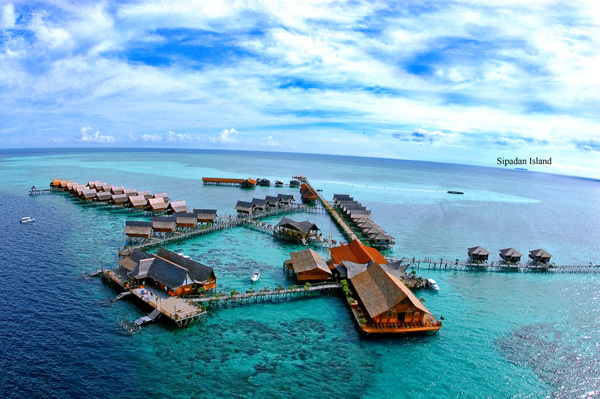 Borneo Divers Mabul Resort, founded by dive pioneer and DEMA Hall of Famer Clement Lee, is a perfect home base for experiencing Malaysia’s pristine, world-class diving. 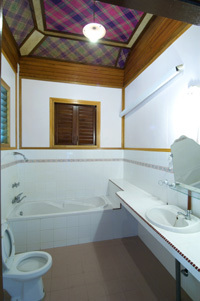 30 units are provided in attractive and comfortable duplex chalets. 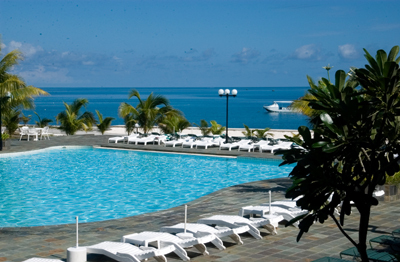 All enjoy views of the beach and mainland Borneo across the Celebes Sea. 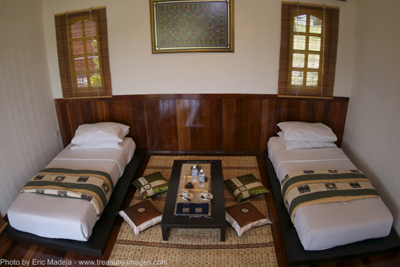 17 Deluxe Twins and 5 Deluxe Doubles (left) feature two twins or one double bed, private veranda, air-conditioning, ceiling fan, dressing table, coffee & tea making facilities, hair dryer, local sarong, private bathroom with hot shower and a comfortable sofa. Also available are 4 Runggus Deluxe Twins (right) and 2 Runggus Deluxe Doubles with low platform beds and floor cushions and 2 spacious Super Deluxe Doubles (below). Enjoy Malaysian, Asian, Japanese, Chinese and Western cuisine served buffet style at every meal. The dining hall complex also houses the front desk, gift shop, conference center, and library/TV room. Kapalai Island, just a few minutes by boat from the islands of Sipadan and Mabul, is where you’ll find the Sipadan-Kapalai Dive Resort. 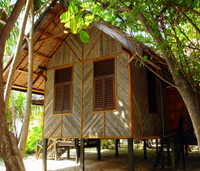 This airy, comfortable water village sits on sturdy stilts above the shallow sandbanks of the Ligitan Reefs. The only land in sight is a mile long sandbank where one can sunbathe at leisure. 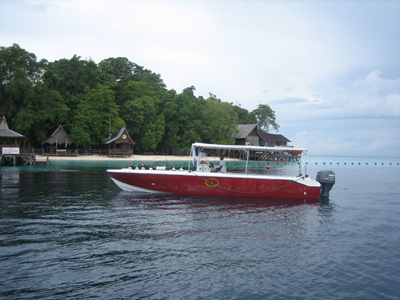 The resort is accessed via boat transfer from Semporna. 59 wooden chalets are linked by miles of wooden walkways. 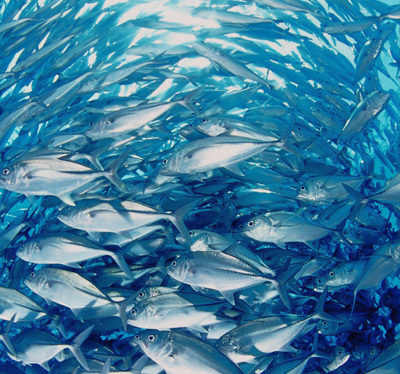 Enjoy a morning jog with thousands of fish swimming just a few feet beneath you. All chalets can accommodate twin and triple sharing and feature very private balconies, bathrooms with shower & tub, toiletries and coffee & tea making facilities. 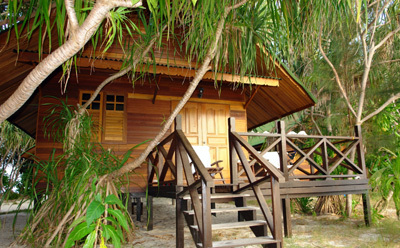 Lankayan Island, an hour and a half boat ride north of Sandakan, is a tiny island covered in lush tropical vegetation and ringed by a white sandy beach. Part of a Marine Protected Area, Lankayan’s dive sites are all just a few minutes away and boast colorful macro and fauna, fascinating wrecks, and even whale sharks from March to May! Green and Hawksbill turtles consider the island to be prime nesting and foraging ground from June to September. 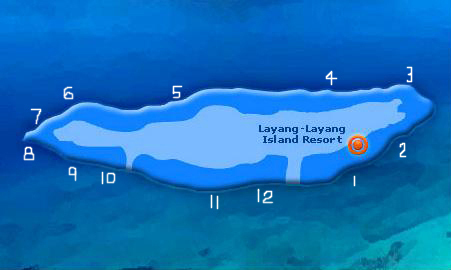 It’s no wonder why Lankayan Island has quickly become a diving “hot spot”. 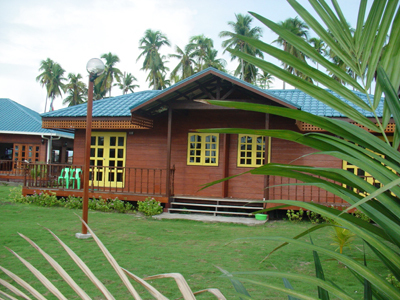 The resort offers 16 roomy and perfectly appointed seafront chalets and 2 bungalows which house 4 and 5 standard room units, respectively. 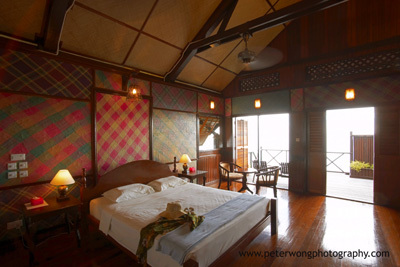 All rooms offer twin and triple sharing and feature a private balcony, hot bath, coffee & tea making facilities, mini fridge, fresh water from the mainland, and both 220 and 110 volt power. 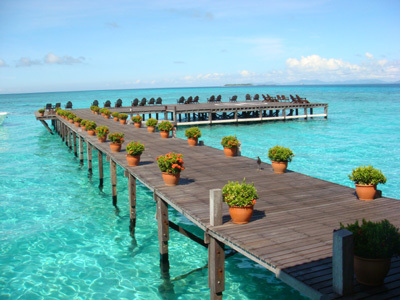 The three star Layang Layang Island Resort is located on a deep sea atoll of the same name off the coast of Borneo, in the middle of the South China Sea. 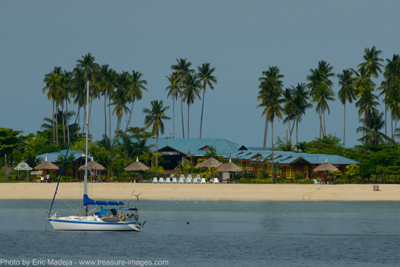 Layang Layang is blessed with 13 coral reefs and a calm lagoon that is teeming with gorgeous marine life. 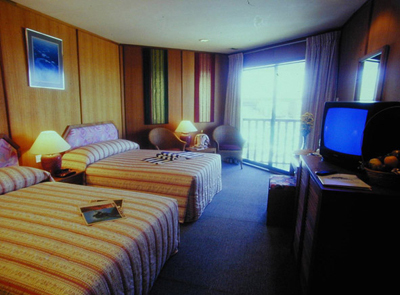 The resort offers 76 Superior Rooms as well as 10 Deluxe Rooms. 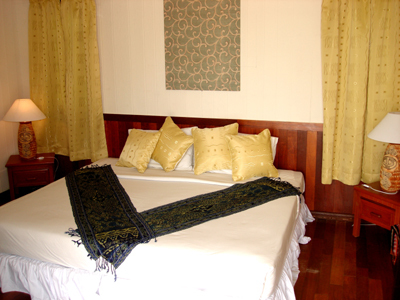 All rooms are air-conditioned, comfortable, and feature two queen size beds, private balcony, private bath with hot shower, telephone, and satellite TV. The restaurant prepares a variety of eastern and western cuisine for every meal. 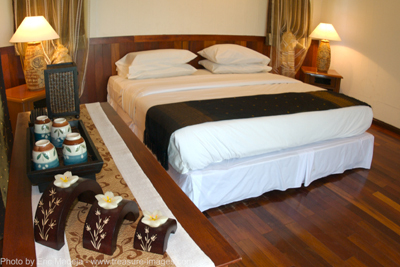 Additional amenities include a swimming pool, bar, massage and foot reflexology services, conference and banquet facilities, reading corner, souvenir shop, and an in-house PADI dive center. 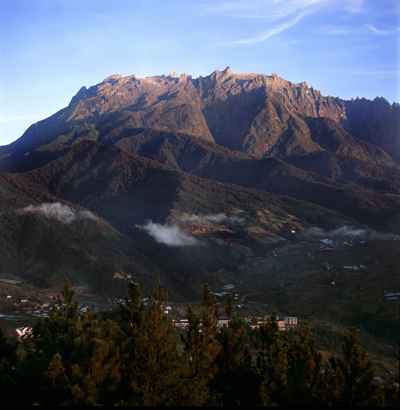 Regular flights from Kota Kinabalu are serviced by a private airline. 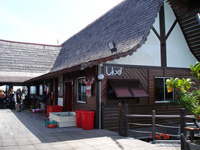 Sipadan Water Village – buffet style dining, local and international cuisine. 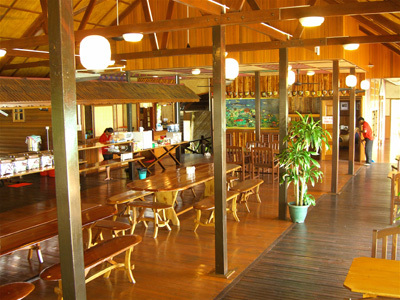 Sipadan-Kapalai Dive Resort – buffet style dining, Chinese and western cuisine, BBQ dinners and seafood frequently featured. 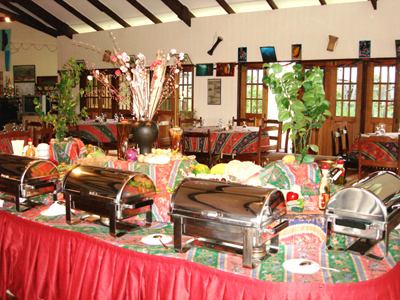 Lankayan Island Resort – buffet style dining, international cuisine, BBQ dinners frequently featured. 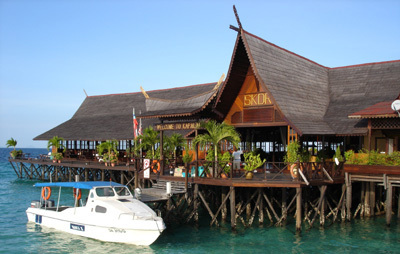 Borneo Divers Mabul Resort – buffet style dining, Chinese, Japanese and Korean cuisine, seafood, international and continental meals frequently featured. Layang Layang Island Resort – buffet style dining, Malay, Chinese, Indian, and continental cuisine, seafood and pasta dishes frequently featured. 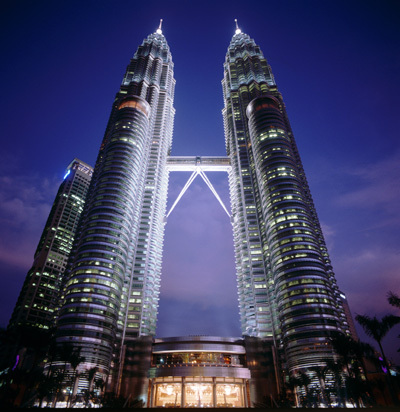 Malaysia is located in the heart of Southeast Asia. 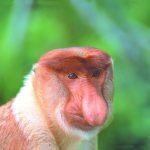 It is divided into 2 main regions: Peninsular Malaysia which lies south of Thailand and East Malaysia which is north of Indonesia on the island of Borneo. For divers, your entry into Malaysia will usually be through Kota Kinabalu. 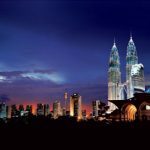 The flight from Los Angeles to Kota Kinabalu is approximately 19 hours and 35 minutes. If you fly into Kuala Lumpur, the flight will take between 19 and 20 hours. Malaysia uses the Malaysian Ringgit. It comes in denominations of RM100, RM50, RM20, RM10, RM5, RM2, and RM1. There are coins of RM 50, 20, 10, 5, and 1. The February 2009 exchange rate between US dollar and Malaysian Ringgit is US $1.00 = RM 3.67. Malay is the official language. English is widely spoken, as are Chinese dialects such as Mandarin and Cantonese. You will need a passport that is valid for at least 6 months from date of entry. US citizens do not need a visa for stays not exceeding 3 months. 220-240 V, 50 Hz. Square three pin plugs are generally used. We recommend carrying your own adaptor or converter. Please always check with your airline for luggage requirements and restrictions. Yes, we always arrange for transfers to and from the airport. Your name and flight information will be given to a transfer company and they will be looking for you. 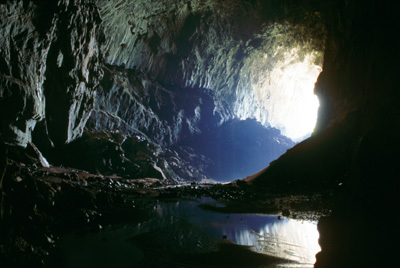 Mabul and Kapalai – Mabul is known for great muck diving, while Kapalai boasts great macro life. Both are excellent for photography. Most of the diving is at shallow depths ranging from 10-60 ft. You’ll see squid, cuttlefish, anemone shrimp, gobies with blind cleaner shrimp, porcelain crabs, juvenile batfish, harlequin ghost pipefish, mushroom coral pipefish, mandarin fish, dragonets and more. Sipadan – This 40 acre island is surrounded by a pristine reef that plunges dramatically into the abyss nearly all the way around. The vertical topography and rich currents provide perhaps the best wall diving in the world! On an average day of diving, you’ll see 50 turtles, a dozen sharks, enormous schools of jacks and barracuda, and an abundance of reef fish and macro life. Lankayan Island – It is a macroworld paradise with subjects like juvenile fishes, clown anemone fishes, decorator and spider crabs, coral shrimps, nudibranchs, prawn gobies, and rarer subjects like jawfish, ghost pipefish, and frogfish. Hard corals, soft corals, feather stars, sponges, and sea fans provide the backdrop. You may also spot schools of scad, yellow tail barracudas, and jacks. A few lucky divers have seen large rays, guitarfish, and manatees. There are even a few wrecks in the area. Layang Layang – An atoll of 13 linked coral reefs that offers outstanding wall diving. A great place to catch hammerheads during their April and May mating rituals and whale sharks when in season. Known for great visibility, large animals, and drift dives. The resort closes between November and January. 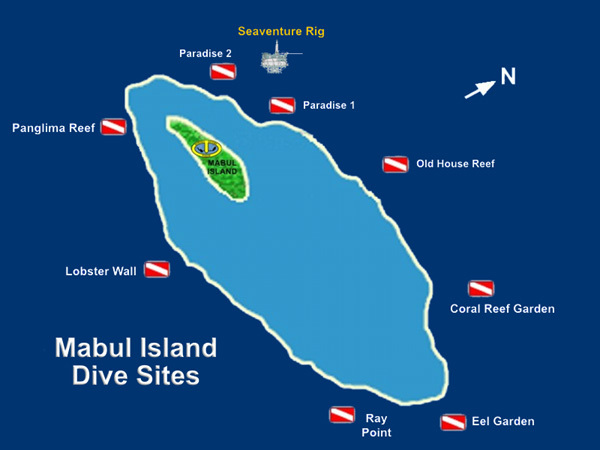 Most dive sites are within a 15-20 minute boat ride of their respective resorts. 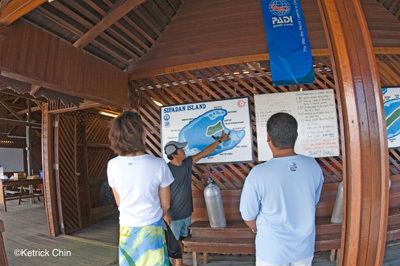 Sipadan Water Village offers 3 dives a day. 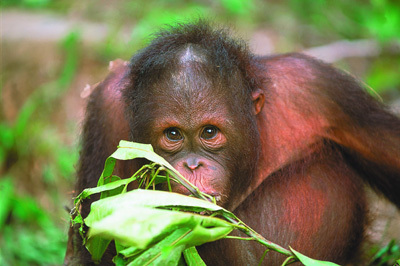 • Borneo divers offers 3 dives a day and unlimited beach diving. 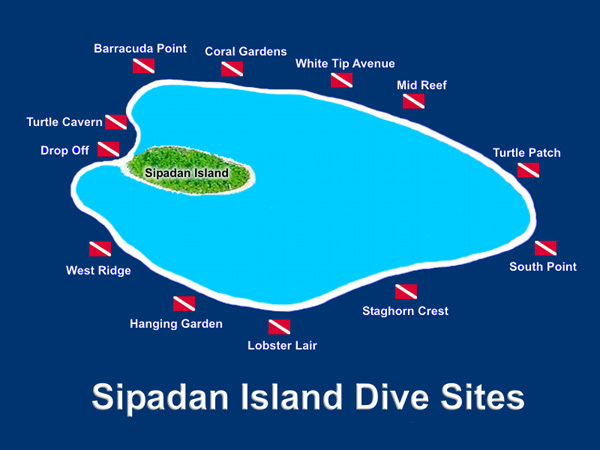 • Sipadan Kapalai Dive Resort offers 3 dives a day – 2 dives at Sipadan, the last dive back at Mabul or Kapalai. 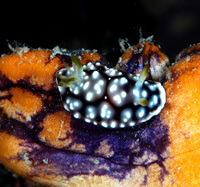 Night dives and sunset mandarin fish dives are available free of charge with a dive buddy. 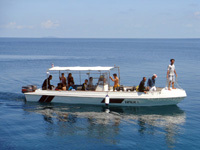 • Lankayan Island Resort offers 3 dives a day. Night dives and beach diving are available free of charge with a dive buddy.